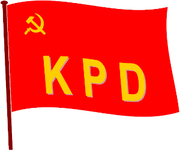 The Communist Party of Germany (German: Kommunistische Partei Deutschlands, abbreviated KPD) is a minor political party in Germany. It is one of several parties which claim the KPD name. It was founded in Berlin in 1990. The party strongly supports Stalinism, and states that it "consistently fights revisionism, opportunism and its main form, anti-Stalinism." It also supports the North Korean regime. The party chairman was Werner Schleese. He resigned in April 2006. The current chairman is Dieter Rolle. The KPD publishes a monthly newspaper, Die Rote Fahne (The Red Flag). The youth wing is known as Kommunistische Jugendverband Deutschlands (Young Communist League of Germany), which was founded 2002. Ahead of the 2005 Bundestag elections, the party unsuccessfully appealed for an electoral union with the German Communist Party (DKP) and the Left Party. 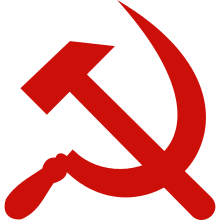 This provoked a split, resulting in the formation of the Communist Party of Germany (Bolshevik), which disbanded itself in 2011. The party failed to collect the necessary signatures to contest the Bundestag elections in the state of Berlin in September 2013. After the reformed SED-PDS had expelled Erich Honecker, the latter joined the ranks of the small KPD, as did his wife Margot Honecker. The party is supportive of the North Korean regime.